EA and DICE have revealed the four expansion packs included in the Battlefield 1 Premium Pass. February 28, 2017 – Today, EA and DICE revealed the first details of all four expansion packs included in Battlefield 1 Premium Pass* with Battlefield 1 They Shall Not Pass, Battlefield 1 In the Name of the Tsar, Battlefield 1 Turning Tides and Battlefield 1 Apocalypse. To expand the global conflict and build on the game’s award-winning multiplayer experience, players will be able to defend their homeland as the hardened French Army and battle in treacherous snow covered ravines with the Russian Army. Players can also engage in intense naval clashes and conquer fiercely disputed ground in the most infamous battles of the Great War. The expansion packs will also include 16 new multiplayer maps, 20 new weapons, and new elite classes. 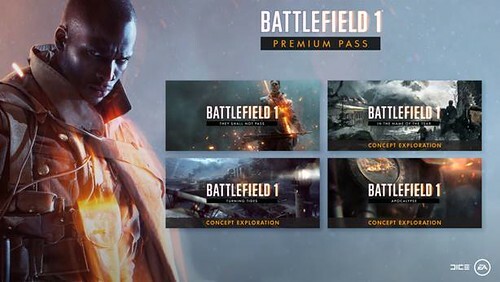 Additionally, Battlefield 1 Premium Pass members will get two-week early access to each unreleased expansion pack, plus 14 Superior Battlepacks, priority sever access and more. Holding out for the patch that corrects some of the SJW crap. then, which one is the closed quarters style map\extension? Little disappointed there won't be a pack with the IJA attacking the Germans at Tsingtao but I guess that's okay. The other offerings seems plenty enticing.